Sally, why would you do that?! No wonder underage pregnancy is increasing, they're starting 'em young now, real young! Now that sounds like some hard p0rn. Is Susan pimping Sally ????? 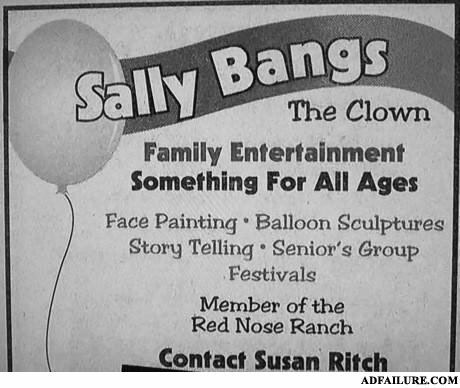 I'd hate to see the baloon animal show! Red Nose Ranch... the alcoholism may be a contributing element. And for the GRAND FINALE ----SALLY TOSSES THE RINGMASTERS SALAD!!!!!! Already saw that on the internet. Pr0n and entertainment for all ages. Well at least we know how Susan got "Ritch" What a way to make a f***** living! I must say, it’s hard to find knowledgeable people on this topic. But I can see you are one of those who know it perfectly! Thanks. aw fck for all ages! im so going there! Now I remember why I hate clowns... they get all the action! Face painting? Yeah, I do face painting..... but that's gonna cost you extra. Clown exhibitionism for all ages!